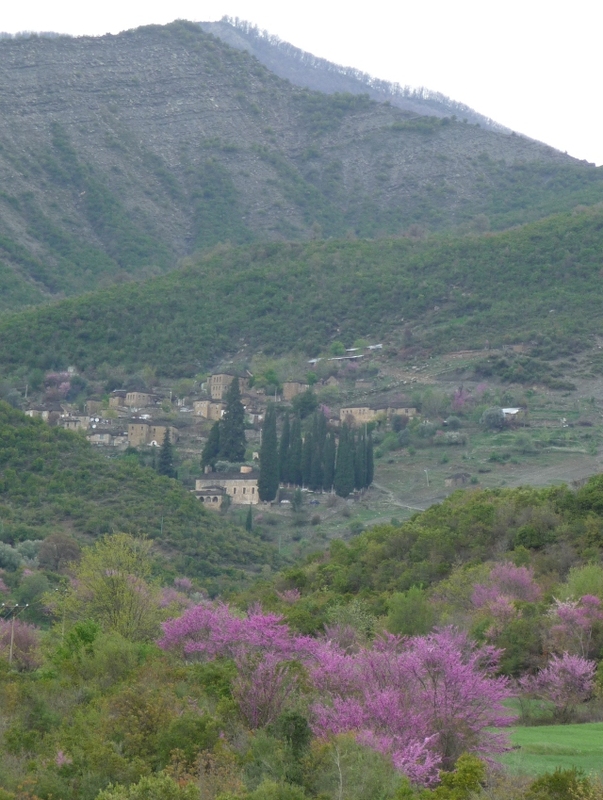 We left Gjirokaster under leaden skies wondering if we’d ever get to see Albania fully sunny. 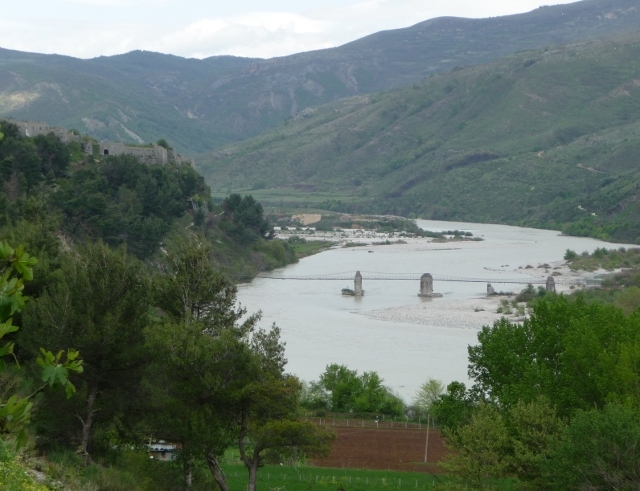 Our first stop as we drove north was Tepelene, home of Ali Pasha who ruled southern Albania and much of mainland Greece in the late 18th and early 19th centuries, building aqueducts, bridges and castles in the region. Lord Byron visited the court of Ali Pasha at Tepelene, and we tried to visit the castle. Shrunk from his deeds of chivalrous emprize. On thee, though rugged nurse of savage men! We were let off from having to pay for parking after intervention from an English speaking passer-by in our discussions with the attendant about how much. Our guidebook (Bradt’s Albania) said the castle was still inhabited and that it was free to wander round inside. A bit misleading, as when we did find our way in through the walls, we found rough tracks leading through a housing estate and you would barely have known you were inside the walls of a castle at all. 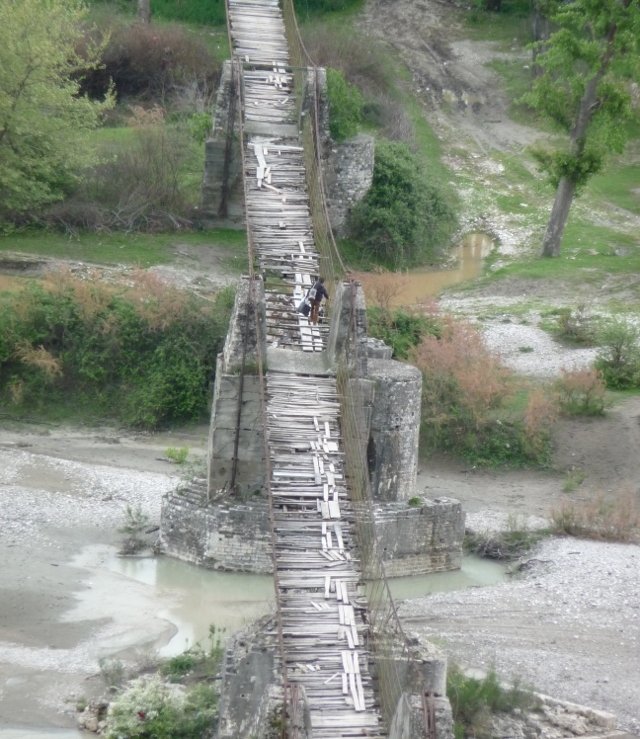 On our way out of town we stopped to peer over the side of the valley to see Ali Pasha’s bridge below spanning the Vjosa river, and still in use … sort of. 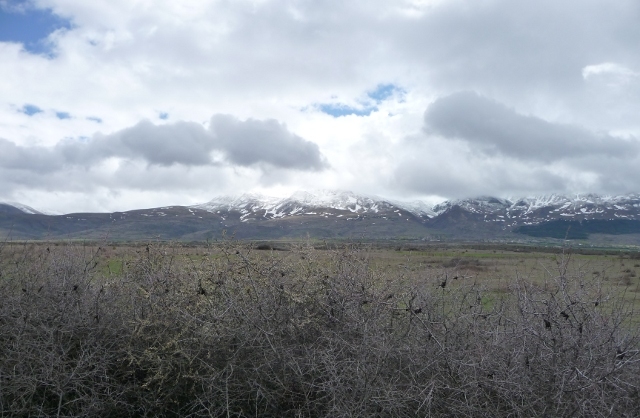 Doubling back on ourselves, we headed south to the turning eastwards and the road to Korça. This numbers among the most scenic routes in Europe. It is the main trunk road to the east of the country, and most of it is little more than an uneven paved lane hardly wide enough for two vehicles to meet, with potholes for long sections and sometimes little more than a rough track. We enjoyed every minute of it though and the sun even graced us with its presence now and then. Dramatic mountains, lush meadows, rushing river torrents and waterfalls crashing down sheer mountainsides, more rickety bridges, eagles swooping in front of the van as they plunged off the side deep into the valley below, ponies and donkeys with their wooden-framed saddles trotting along, cheery waves from their riders. Parking up to take a picture and being greeted by a young boy fishing off a rock on the opposite side of the river. The countryside grew ever more remote and stunning views met very bend. 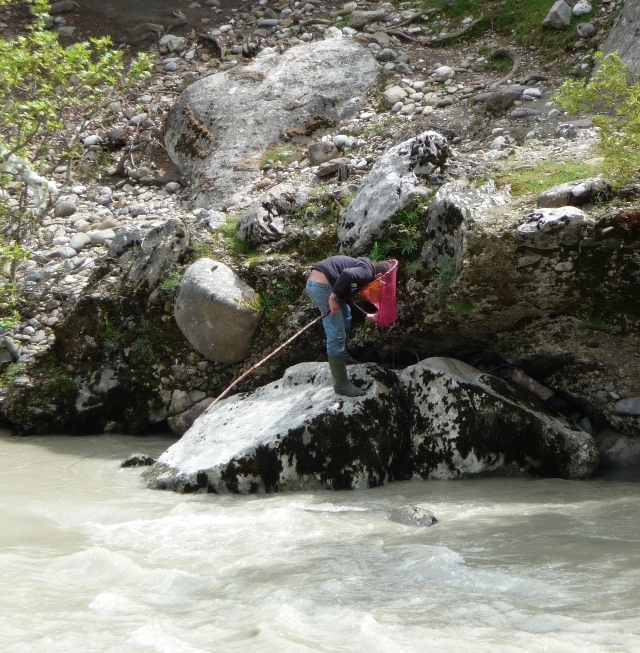 We passed through the busy town of Permeti in its lovely setting among huge rocks along the river where school was kicking out and children were meandering haphazardly along its streets. Then more wilderness and as we wound through ever more remote mountains, the weather started to close in as we slowly neared our destination for the night. There was a turning off towards some thermal baths a few kilometres away and we decided to have a look. 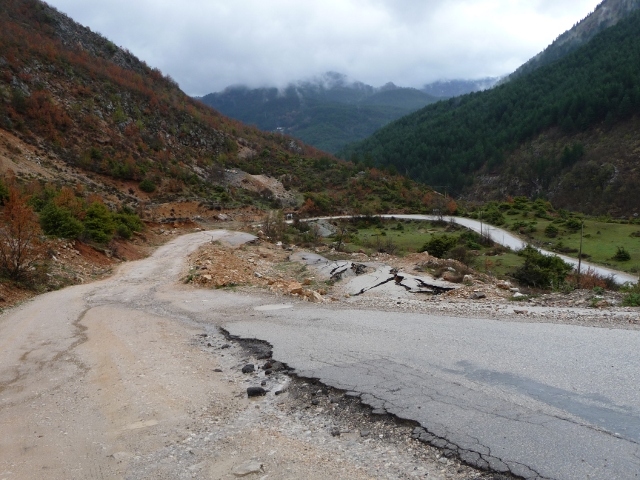 This minor road was very new and perfectly smooth, it lead gently along a valley with abundant pink blossom and forested hills until it ran out into roadworks and a couple of pools of what could be called bubbling water, but we weren’t quite sure. Nothing fully developed then, in spite of the brown sign and new road. On the way there, we had spotted a lovely looking village up in a fold of the hills, but the rough track that seemed to be the only way there started with a gushing stream it would have been impossible to ford. 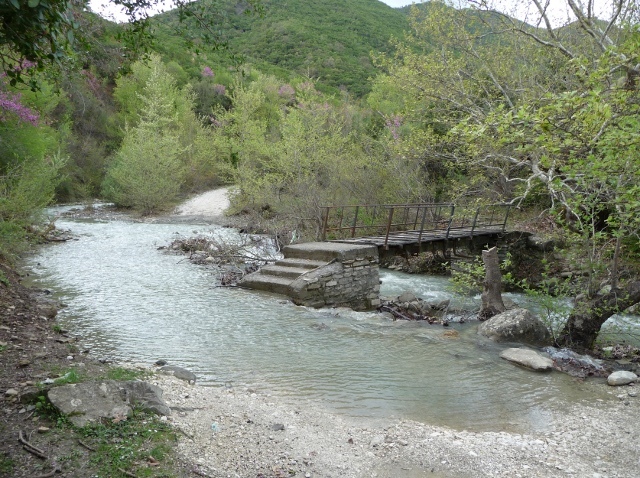 Farma Sotira is a family run trout farm and taverna with guest chalets and camping located north of Leskovik as the road to Korça turns north and runs parallel to the Greek border a few kilometres hence. It is a peaceful beautiful place to stop in the heart of the Gramoz mountains and when I first found it on the internet, I’d envisaged us spending a few days there enjoying the fresh air, doing a bit of hiking and so on. We arrived in torrential rain, low on petrol, the station at Leskovik with its hut and indoor petrol pumps had been closed. The ground was sodden as were our spirits. Inside the taverna though, there was a roaring fire to sit and dry off by and we were served one of the most exquisite fish dinners ever with the freshest possible trout, chips and a whole range of beautifully presented salads, all washed down with their own wine. Dinner and camping combined came to about £12. There were just two other guests, staying in one of the chalets, and luckily for us they spoke English. Ilva is a lawyer from Tirana and Guzman is from Spain, and we spent a very pleasant evening chatting to them. 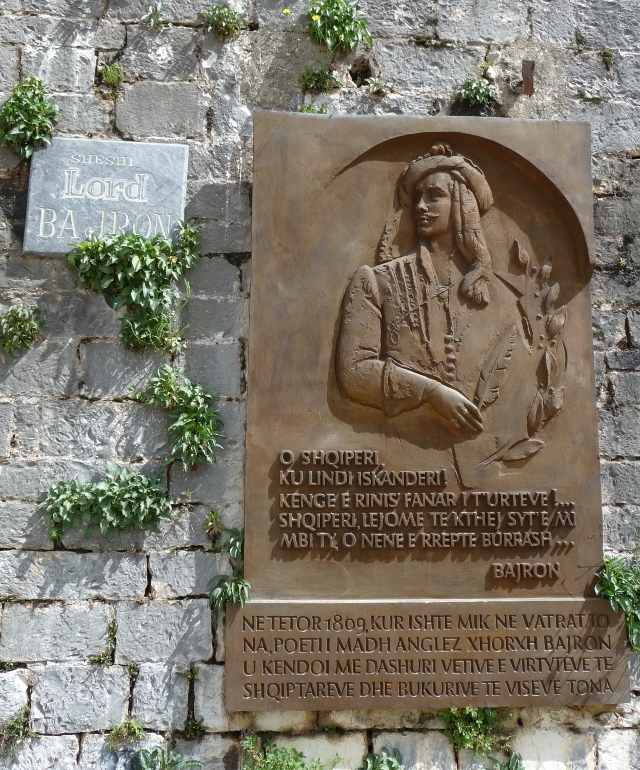 Ilva had studied in Spain, something that wasn’t available to Albanians before the early nineties. Her uncle had been imprisoned for 26 years for trying to leave Albania to study in Rome. Ilva spoke of the zeal of the Albanian people in rebuilding the country after the fall of communism and the following anarchy. She had never been to London though – the high cost of applying for a British visa (around 100 euros), plus the expense of translating accompanying documentation is prohibitive, especially when visas are often turned down with no reason given and no refund of the fees. Freedom of travel can still come at a price. We as British subjects need no visa to enter Albania, and Albanians don’t need a visa for the Schengen countries. This cosy evening of good food and new friendships set us up for spending the night in a damp van that had sprung new leaks … and the rain kept on pouring. The morning started brightly though with a short but welcome sunny interval and after a good breakfast we set off again towards Korça. The high mountains were snowy and the hillsides were covered in young oak trees with their autumn garb on – spring had yet to begin here. It was about 40 slow kilometres to Erseke, the nearest place likely to have petrol. The road was as erratically rough as ever. At 900 metres, Erseke is Albania’s highest town, it seemed a dreary place, but we found petrol at the third station we tried, having enjoyed the brand new asphalt of the by-pass, overshadowed by the huge dilapidations of former factories, past people chasing various runaway livestock … horses and cows. As we approached Korça, the valley opened out to a plain in the lea of the mountains, and we passed through the deeply potholed streets into the bustle of this large town. This entry was posted in Art & Culture stuff, By Country - Albania, Food stuff, Officialdom stuff, Travel stuff, Wildlife stuff. Bookmark the permalink.